Chiefly remembered as Darwin’s captain on HMS Beagle, Robert FitzRoy's life was an eventful one. An ill wind blows: Robert FitzRoy, early-mid 1860s. 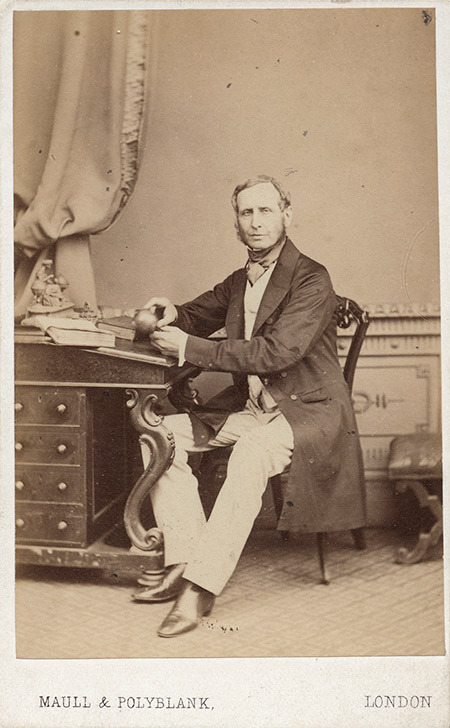 Robert FitzRoy, the superb sailor and founding father of the Met Office, is often remembered merely as Charles Darwin’s taciturn captain on HMS Beagle. Jon Amiel’s 2009 film Creation encapsulates this view – it pictures him bedecked in his naval uniform, his great cocked hat arching into a grim South American sky as he struts along a wind-blasted beach in Tierra del Fuego. The significance of the Beagle’s second voyage, realised with the publication of Darwin’s On the Origin of Species in 1859, ensures that this is the FitzRoy that we are left with. He is the man who sailed Darwin around the world, as the young naturalist formulated his paradigm-shattering ideas about the past. But this vision obscures the richness and importance of FitzRoy’s life beyond the Beagle. He was also a politician, a governor, a scientist and a civil servant who counted as friends not just Darwin but also Sir Francis Beaufort, Sir John Herschel and the chemist John Hall Gladstone. Robert FitzRoy was born in 1805 into a family with a potent pedigree: he could trace his ancestry back to Charles II. It was thought, though, that the young Robert inherited his dark, handsome appearance and ‘highly courteous manners’ from his mother’s side of the family, reminding those who met him of her famous half-brother, Lord Castlereagh. Yet all seemed well for FitzRoy on his return from his circumnavigation. By the time Queen Victoria ascended the throne he was installed at an upmarket west London address and was a man of note in the newspapers. Elected the Tory MP for Durham, a position in Peel’s Cabinet beckoned, which might have materialised had he not been dispatched to New Zealand as governor in 1843. But accepting the post turned out to be a terrible mistake. One journalist later wrote, ‘A more thorny path he could hardly have chosen.’ FitzRoy sailed around half the world to find the infant colony near bankruptcy and torn in two by a bitter conflict between the Maori tribes and western settlers. All he tried backfired and, judged a failure, he was recalled to Britain after just two years. Arriving back in London, FitzRoy found himself in an uncomfortable position. His political career had been curbed by the New Zealand fiasco, much of his private fortune had been spent during the Beagle voyage and younger captains had filled his place in the navy. Spells followed superintending Woolwich Dockyard and launching the navy’s first screw-driven vessel, HMS Arrogant. Against the advice of Darwin he took Arrogant on her maiden voyage where, off Lisbon, he was gripped by another depressive episode. In a fatal move he resigned his position and returned home. A domestic tragedy followed in 1852 when Mary, his ‘beautiful and religious’ wife, died suddenly, the effect of which was profound and lasting. FitzRoy emerged from a period of despair with an extraordinary new venture, founding the Meteorological Department, now known as the Met Office. Originally conceived as a chart depot to cut sailing times, FitzRoy reinvented it as a weather prediction office, offering warnings of bad weather for sailors at sea. Soon he was ‘forecasting’ – FitzRoy’s own term – coming weather in The Times. It was a controversial project and by the 1860s it had made him a national celebrity. Punch christened him ‘The First Admiral of the Blew’ and ‘The Clerk of the Weather’; his telegraphed forecasts a colourful quirk of this new Victorian world. FitzRoy’s meteorological project ensured his name was always in the papers, as much perhaps as Darwin’s, but the pressure of predicting coming weather began to tell. He had to contend with a hostile press and a nervous scientific community. By 1865 his health was failing and he was forced to move to Norwood for a period of rest. On Sunday, April 30th, he rose for church and kissed Laura, his daughter, as he walked to his dressing room. Then he turned the key in the lock, picked up his razor and cut his throat. Peter Moore is the author of The Weather Experiment: the Pioneers Who Sought to See the Future (Chatto & Windus, 2015).